Toyota AD830 9 Needle Embroidery. Toyota AD860 12 Needle Embroidery Machine Specification. Automatic Colour Change Mechanism Integration of mechanical action with computer controlled electronics enhance fast and reliable thread colour change during embroidery. A single needle bar mechanism ensures stable and accurate stitching that was once considered unattainable with multi needle embroidery machines. 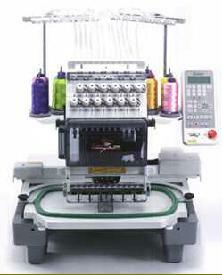 Nine colours and automatic thread trimming are available to the operator. Used Toyota AD860 Expert for sale. Compact, User Friendly, Safe To Use. Good user ergonomics are built into the Toyota AD860. All features are within quick reach of the operator. To enhance operator safety, the machine will only operate with the face cover closed. 1 only complete with cap frame, hoops and software £5250 plus v.a.t. Subject to being not sold.